The site in which the Pleasure Garden now stands was the result of WW2 bomb damage. In the 1970’s the Council erected a couple of swings and seats but then didn’t maintain them and seemed to forget the site even existed! Without maintenance the park fell into disrepair; dominated by stinging nettles and dog mess. In 1990 a builder working in the area applied to the Council to use the site as storage, which both alerted the council to the fact that they owned valuable ‘idle land’ and the Residents to the fact that the land could be sold for development. 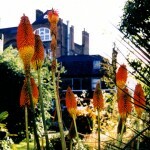 The Bonnington Square Garden Association was formed by Local Residents to lay claim to the “wasteland”. Thus after prolonged negotiations with the powers that be money became available from a joint Government and Local Council scheme and construction began in August 1994 transforming the land into a little slice of paradise that now beholds you – ‘The Pleasure Garden’. The Garden is, of course partly in homage to the Vauxhall Pleasure Gardens which existed 100m to the north of here and were a major feature of London for three centuries; a place of curiosity, promenade and play. The garden, surprisingly perhaps was designed ‘by Committee’ – several local residents and an Architectural firm. The intention was to create a gentle and beautiful slice of nature that could serve all sides of the community. A delightful play space for the kids and something of a sanctuary from the big city storm for the adults. It is one of the beating ‘hearts’ of our community and a place of pilgrimage for many more. 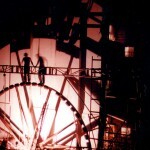 The wheel at the end of the garden, is a classic piece of Industrial Revolution Art dating from the 1860’s. It was rescued from a nearby marble factory (under demolition as we were constructing) where it was used to ‘wet cut’ marble. Legend has it that once a year the wheel turns, bringing forth beautiful, crystal clear champagne from the worlds below…a delightful fishing boat that floated above the pergola on a sea of wisteria set sail one midnight eve ne’er to be seen again – but only ever for believers. The garden is open from morning to evening, open to all and is lit up at night with up-lighters and fairy lights that transform it into a place of serene magic. The garden is locked at night. It is exclusively maintained by the residents, receiving no ongoing funding from any source other than the generosity and tenacity (for fund raising) of those who use and love her. The association is open for anyone to join be they resident or friend. Having completed the Pleasure Garden, the Garden Association then went on to create the Paradise Project, extending the garden’s philosophy out into the surrounding neighbourhood by planting trees, vines, street gardens in every available space. Like the garden this is an ongoing project to attempt to provide some harmony between nature and inner city living.